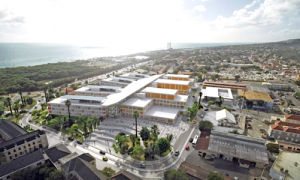 WILLEMSTAD - More than 100 new positions will be added when the new hospital is completed. The functions must be filled in as much as possible by the staff of the current hospital. This was announced by director Gilbert Martina and he emphasizes that the current staff keeps their current job as much as possible. 82 percent of staff can keep their current job in the new hospital. There was a concern if the remaining 18 percent would keep their job. They are now being offered a job in the new hospital that fits in as much as possible with their old job. The union representing these employees announced recently that it is ready to take actions if there is a threat that some people would lose their jobs. But Martina stresses that this is not the case. The union called off the action but said that it will remain vigilant.